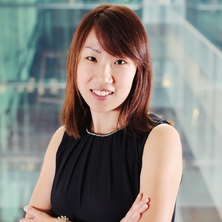 Dr. Li Lin spent 4 years involved in skin-related research and the set-up of clinical-testing facilities at Procter & Gamble Singapore from 2005. She moved to Queensland in 2009 to pursue higher education and has graduated with a PhD in biomedical engineering from The University of Queensland, supervised by A/Prof Tarl Prow (Deputy Director of Dermatology Research Centre and Prof H. Peter Soyer (Director of Dermatology Research Centre and Chair of Dermatology Department at Princess Alexandra Hospital). Her PhD training was focused on the development of a new micro-sized skin biopsy device for molecular diagnosis of skin diseases. She is currently a NHMRC Peter Doherty ECR Fellow at The University of Queensland whose research interest is to develop new technologies with focus on drug delivery, diagnostics and imaging in the context of dermatology. Ardigo, Marco, Agozzino, Marina, Lin, Lynlee L. and Prow, Tarl W. (2017). Reflectance confocal microscopy-guided microbiopsies for targeted molecular analysis. In Reflectance Confocal Microscopy of Cutaneous Tumors (pp. 52-57) Boca Raton, Florida, United States: CRC Press. Li, Lynlee L. and Prow, Tarl W. (2017) Novel microdevices for controlled blood and skin extraction, NHMRC. Impact, 2017 6: 58-60. Lin, Lynlee L., Van Hoang, Nufer, Kaitlin L., Tomihara, Shoko, Pham, Kim and Prow, Tarl W. (2017). Microscopic evaluation of ZnO sunscreens in vivo. In: Annual Meeting of the American-Academy-of-Dermatology, Orlando, Fl, United States, (AB170-AB170). 3-7 March 2017. Banzhaf, Christina, Lin, Lynlee, Dang, Nhung, Yamada, Miko, Belt, Paul, Soyer, Peter, Freeman, Michael, Haedersdal, Merete and Prow, Tarl (2017). The coagulation zone acts as a reservoir for sodium fluorescein. In: Annual Meeting of the American-Society-for-Laser-Medicine-and-Surgery (ASLMS), San Diego, CA, United States, (3-4). 5-9 April 2017. Sobarun, P., Hoang, V. L., Yamada, M., Lin, L., Tomihara, S., Lambie, D., Soyer, H. P. and Prow, T. (2016). Microbiopsy biomarker profiling in a case of melanoma resembling a pigmented basal cell carcinoma. In: *, *, (39-39). *. Hang, Lydia Y. T., Lin, Lynlee L., Yamada, Miko, Soyer, H. Peter, Raphael, Anthony P. and Prow, Tarl W. (2015). Microbiopsy skin sampling in volunteers reveals no oxidative stress detected after topically applying sunscreen with zinc oxide nanoparticles. In: Poster Abstracts, American Academy of Dermatology 73rd Annual Meeting. 73rd Annual Meeting of the American Academy of Dermatology, San Francisco, California, (AB210-AB210). 20–24 March 2015. Baillie, L., Prow, T., Lin, L., Sim, P., Chai, E. and Soyer, H.P. (2011). Non-invasive assessment of skin ageing. In: x, x, (8-8). x.
Prow, TW, Liu, D, Faye, R, Lin, LL, Grice, JE, Soyer, HP and Roberts, MS (2011). Simultaneous imaging of metal nanoparticle penetration and metabolic changes in human skin using fluorescence lifetime imaging. In: Experimental Dermatology. 38th Annual Meeting of the Society-for-Cutaneous-Ultrastructure-Research, Brisbane Australia, (E873-E874). May 30-31, 2011.